Since moving from the city to the ‘burbs, I’ve gotten reacquainted with one of my weekly teenage chores (for which I received a $5 allowance): mowing the lawn. Back then, my Dad did the trimming work after I finished cutting. Now as an adult and homeowner I’ve embarked on my own journey to learn the art of weed whacking. It looks very simple. (Dad made it look so easy!) But I’ve found it takes a lot of practice to be good at it. I admit to having felt overwhelmed and angsty about the task at the start of summer, but over the last few months I’ve learned a few things that help to make the job less stressful. Regular Maintenance. If you clean your trimmer at the end of each use, it will be a cinch to get started on the next go ’round—you’ll avoid false starts and frustration. After your trimmer cools, remove any clippings or dirt around the string head with a brush and get your line out to the level you like for cutting. Before putting your trimmer away, check your fuel and oil if you have a gas model, or set it to charge if battery-powered. Proper Dress. Outfitting yourself for the job can help ensure you don’t whack yourself along with the weeds and grass. Closed-toed shoes, long pants or high socks, garden gloves and eye protection are strongly recommended. If the loud, high-pitched whine of the average weed whacker puts you on edge, use ear protection. Or better yet, how about counter-blasting some Enya on your iPod? Good Posture. Weed whacking can be back-breaking if you don’t let your body and trimmer work together. Keep your shoulders back and your knees soft. 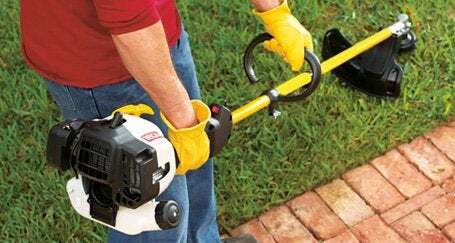 Pick up the trimmer with your right hand on the throttle end and your left hand on the assist handle. Keep the power unit at about waist level, with the attachment and head parallel to the ground. Squat by bending your knees; resist the temptation to simply bend over. You may feel a little silly (or like a duck), but your back will thank you later. Technique. Hold your trimmer parallel, 2 to 3 inches from the ground, and use an even, side-to-side sweeping motion. Working in the direction that your trimmer head spins will make the work easier. In other words, if your trimmer head spins clockwise, work from right to left. 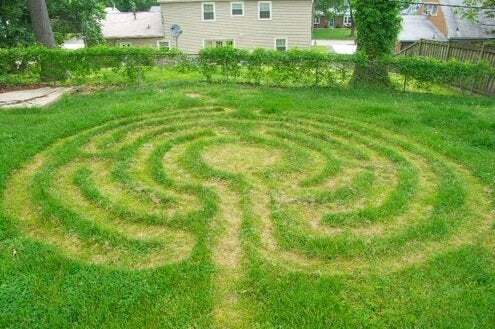 By the end of summer, I plan to have perfected my weed whacking technique and ethos to the point where I can trim and edge the lawn solely with my mind. Well, OK—that might be a bit ambitious. But I will continue to stay cool and chant my mantra: trim, edge, happy, happy… trim, edge, happy, happy….